going to love this software. Win*Star Express V3 was designed specifically for amateur astrologers, students, and novices, and even Professionals throughout the world swear by this program. This program has a wide range of supportive learning tools that let you easily produce professional-level results � even the first time you open the program � and put those results to work for you right now. Create a natal chart and reveal characteristics and facts about yourself, family members, friends, or love interests that may surprise you. Click a button and you have an instant transit or progressed chart that gives you an advance look at upcoming events. Pop into Day Scan and you have a detailed list (with interpretations) of planetary events which may influence your life � look hour-by-hour or at weeks, months, even years at a time. 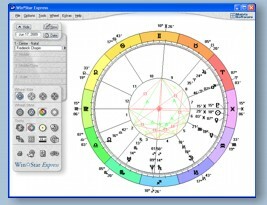 Win*Star Express V3 also lets you do instant Solar and Lunar return charts. They're amazing! Have you heard what others are saying about Win*Star Express? Software for Windows XP and Vista.